In what is becoming an increasingly familiar scene, the fascists on the left have ginned up another fabricated story in yet another attempt to portray conservative Americans as hateful and intolerant by accusing a group of Trump-supporting, pro-life teenage boys of taunting a Native American man at the March for Life rally in Washington, D.C.
We’ve seen this before, haven’t we America? The throngs of women who came out of the woodwork to falsely accuse Justice Brett Kavanaugh of sexual assault to discredit his nomination to the Supreme Court in the attempt to smear his good name and reputation because he wasn’t a progressive leftist? Now it’s time for the left to completely and totally destroy the lives of a group of Catholic School boys by making up a story to whip the left into another Kavanaugh-type frenzy. 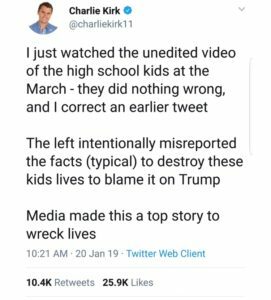 Sadly, before America found out this story was yet another incident of “Fake News”, it made the rounds to numerous media outlets and before you know it, the social media lynch mob was doxxing and calling for violence against the boys. 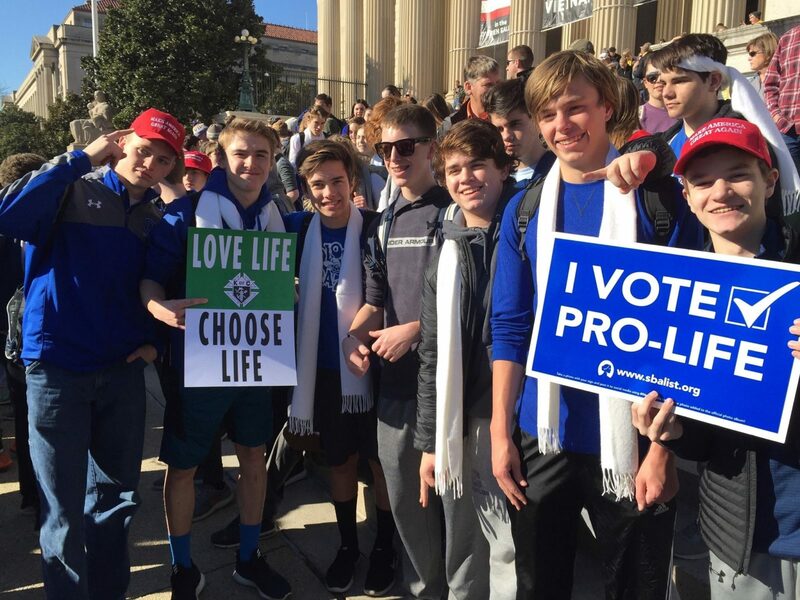 The group of young men from Covington Catholic School in Kentucky were in the Nation’s capital to attend the March for Life Pro-Life rally on January 18. According to some sources, there were over 100,000 people in attendance at this event. 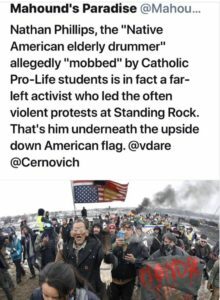 And like a turd in the punchbowl, the leftist activists also were there to set up someone on the pro-life side to make them look bad. What better target than a group of pro-life young men from a Catholic school from somewhere in middle America? The Native American man in question, Nathan Phillips has been identified as a serial activist. The Guardian called Phillips “a well-known Native American activist who was among those leading the Standing Rock protests in 2016-2017 against the construction of an oil pipeline in North Dakota”. A photo surfaced of Phillips standing front of the Trump International Hotel in Washington, D.C. on April 27, 2017 where he is identified as “Native Youth Alliance Executive Director” and beating a drum to rally against the Dakota Access Pipeline. Apparently, Phillips is no stranger to the limelight. There is a Wikipedia page for Phillips which chronicles a similar incident in 2015 where Phillips claims to have been racially harassed by a group of students from East Michigan University. FOX News reported Phillips filed a report of racial harassment with Eastern Michigan University campus police against 30 to 40 students who had “referred to themselves as the Hurons, the former mascot at EMU”, dressed as Native Americans for an American Indian theme party. Phillips was also the subject of an award-winning documentary, Between Earth and Sky and has appeared in a music video about attacking police called “Make it Bun Dem” by Skrillex and Damian “Jr. Gong” Marley. In the video, Phillips is shown doing some spiritual warfare connected to a violent attack on a police officer. The boys from Covington Catholic School said they did nothing wrong. One of the students wrote to a local news outlet in Cincinnati begging the station to tell the full story about what really happened at the march. Go to Google and type in “Nathan Phillips” and despite the story being proven fake, Google still has it’s top searches blaring headlines like “Catholic School Boys Taunt Native American Man.” You have to really scroll down in order to find a story that reveals that the story was fabricated. A story from the National Review says Nathan Phillips lied. This lie has set off a national firestorm calling for the assassinations of 16 year old boys over something that only Phillips claims they said. There is no video proof that the boys told Phillips that the wall should be built. Phillips claims that the boys surrounded him, when several videos of the incident in question shows Phillips going up to the boys and banging his drum literally inches away from the face of one young man. Leftist politicians, in true totalitarian form are looking to ban all teens from wearing “Make America Great Again” articles of clothing. How frightening is that? 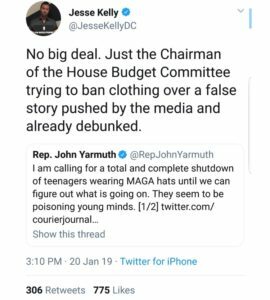 Democrat Representative John Yarmuth of Kentucky tweeted, “I am calling for a total and complete shutdown of teenagers wearing MAGA hats until we can figure out what is going on. 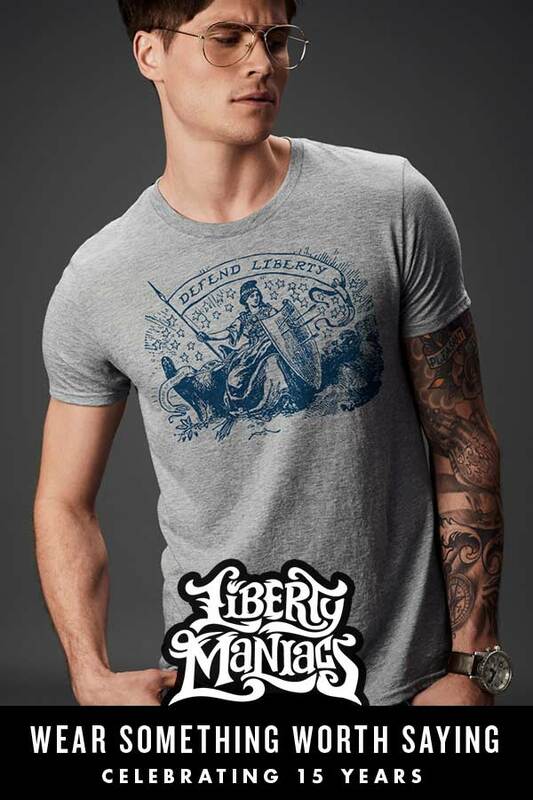 They seem to be poisoning young minds.” Didn’t the left just lose a Supreme Court case that barred voters from wearing clothes with political message at polling places? Now, the left is trying to bar anyone on the right from wearing clothes with a pro-Trump message in the public square. The left is attempting to stop those of us on the right from showing up at any rallies that support our causes. The problem is that they keep using the same players over and over again who keep showing up in photos and past protests that proves that they have a shallow bench of useful idiots to choose from to create false stories. Several of Justice Kavanaugh’s accusers admitted they have lied about him in order to stop his nomination to the Supreme Court. Although the story about the Covington Catholic School boys has been proven false, the damage has been done by the left and surely, it will make the right leery about ever attending a rally to stand up for their rights and beliefs.